Get ready for an exciting race around the railway as Thomas and Percy compete for first place! 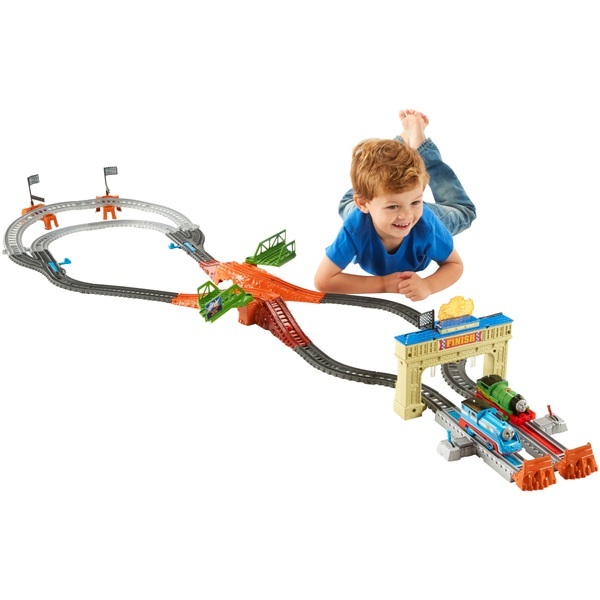 Inspired by the Thomas & Friends DVD, The Great Race, the TrackMaster Railway Race Set from Fisher-Price delivers fun, fast thrills with cool motorized action! Children will love watching two of their favourite characters head for the bridge, which bursts apart to make way for the speeding engines. Once Thomas and Percy complete the full loop and the first engine crosses the finish line, a flag and fireworks pop up from the gantry! For even more racing fun, this train set includes a uniquely designed racing Percy engine, and a special streamlined racing Thomas, so children can experience high-speed suspense as the engines go head-to- head in a rousing railway race!